Hakonechloa macra Aureola brings a soft flowing grace to a shade garden. The Golden Japanese Forest Grass can light up a shaded part of the landscape. Hakonechloa macra Aureola grows to 18" in a slowly spreading clump. Hakonechloa macra Aureola requires a moderate amount of water, less than a lawn, but more than some of the more drought hardy perennials that I usually work with. The Golden Japanese Forest Grass will look best with an annual Winter haircut. I cut the foliage up as long as possible to enjoy the Fall Colors and then cut the stalks nearly to the ground as the new shoots appear. Hakonechloa macra Aureola is Winter hardy to zone 4, maybe 3 with help, regardless, far colder than we are likely to find here in California. 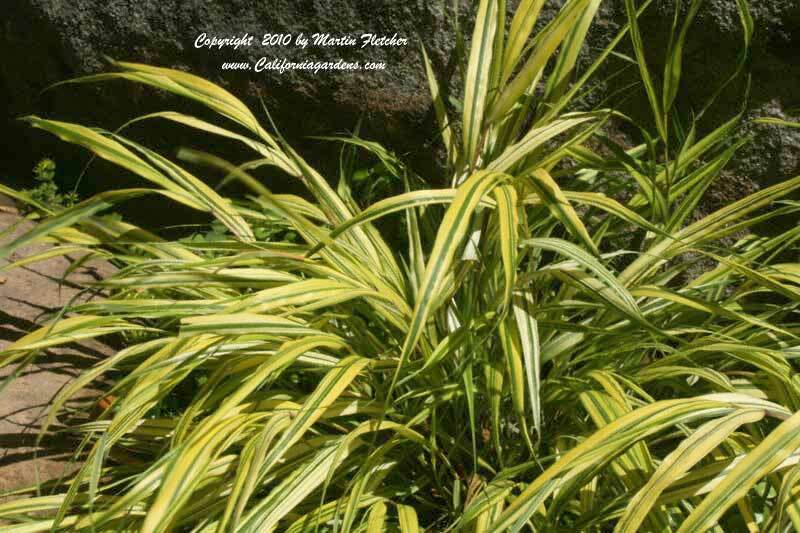 Variegated gold green foliage of Hakonechloa macra aureola - Golden Japanese Forest Grass. High resolution photos are part of our garden image collection.